It’s a bittersweet month for us. It is the last month that my daughter will be at her preschool. The daycare/preschool that she attends has a special place in our hearts. From the time my children were each 8 weeks old, they have attended this school. Since I am now a stay at home mom, they no longer attend the “daycare” portion of the day there. My daughter, however, attends Voluntary Pre-Kindergarten at the daycare for three hours each morning. I don’t remember there being a big to-do at the daycare over Teachers Appreciation. However, Teacher’s Appreciation Day is a big deal at Pork Chop’s Elementary school. There are “suggestions” for each day of the week. Pork Chop and I decided to get a potted herb plant (which was on the teacher’s “wish list”) and decorate the pot for his teacher. It is a continuation of the our decoupaging flower pot project. I am all for personalizing store bought gifts. It’s the best of both worlds. Whether you decorate the packaging or the item itself, the gift is still unique and shows the thought and consideration put into it. 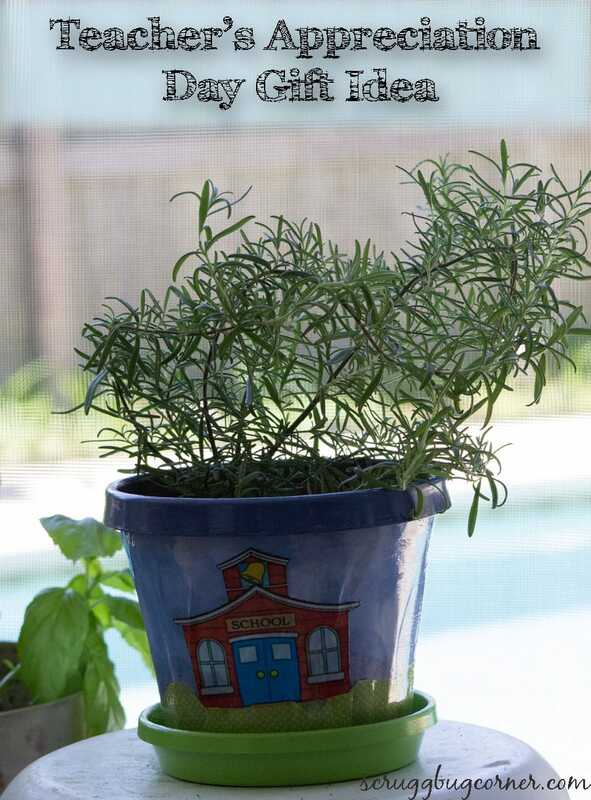 We purchased a rosemary plant from the nursery. I love the way it smells and find that it is pretty hardy in our climate. In keeping with the school teacher theme, I came up with the somewhat cliched idea of using a schoolhouse motif. 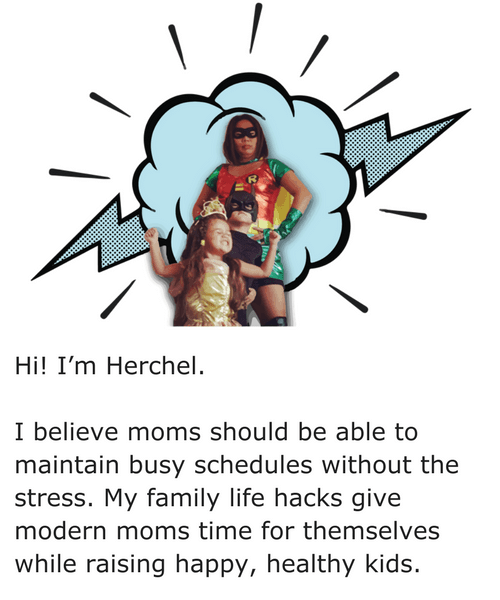 Whatever–I liked the cute school house clip art! It didn’t even occur to me that it would be unoriginal until I read an article that showed handmade gifts with apple or schoolhouse motifs on the list of things teachers don’t want to receive! Paint the top of the plastic pot periwinkle blue and let dry. Paint the saucer a green that matches the paper. 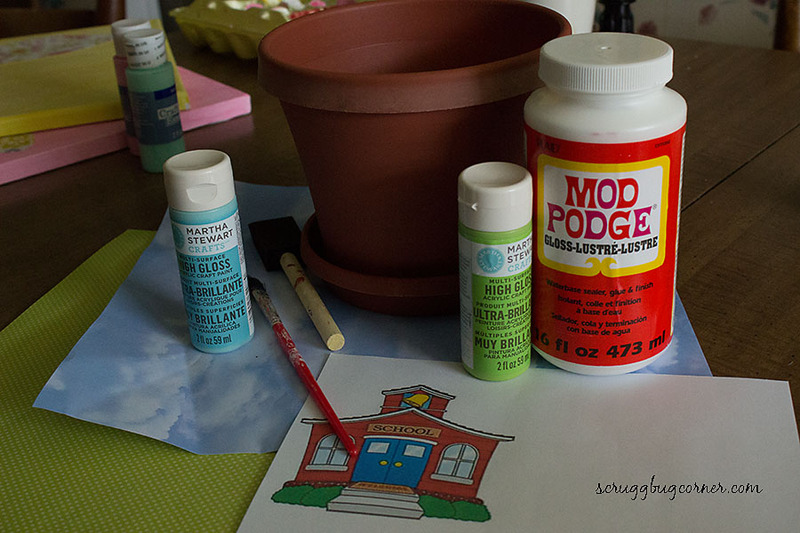 Modge Podge the “sky” paper to the top 3/4 of the plastic pot. Print out and cut out the school house clip art. Glue it to the plastic pot. I cut the green paper into “hills” and modge podged it to the bottom of the pot. Modge Podge over the entire pot to seal it. After it is dry, seal it with the polyurethane or polycrylic. Transplant the plant into the pot. Personally, I think it is cute and functional. I like the backdrop of the sky behind the schoolhouse. Though we originally purchased the plant based on Pork Chop’s teacher’s list, Pork Chop and Pea decided that they wanted to give the plant to Pea’s preschool teachers. Both of her teachers previously taught Pork Chop. The kids decided that Pea’s teachers have always loved them both and cared for all of the kids in their charge. Both of them will miss Mrs Martino and Miss Jenn, since they will no longer be enrolled in the aftercare or summer programs at our La Petite Academy. I will miss the daycare’s willingness to communicate with the parents and the understanding and care they took to ensure both of my children were well cared for. It’s been a long six years and I, for one, am proud that my children decided to show their appreciation to the teachers at the daycare.